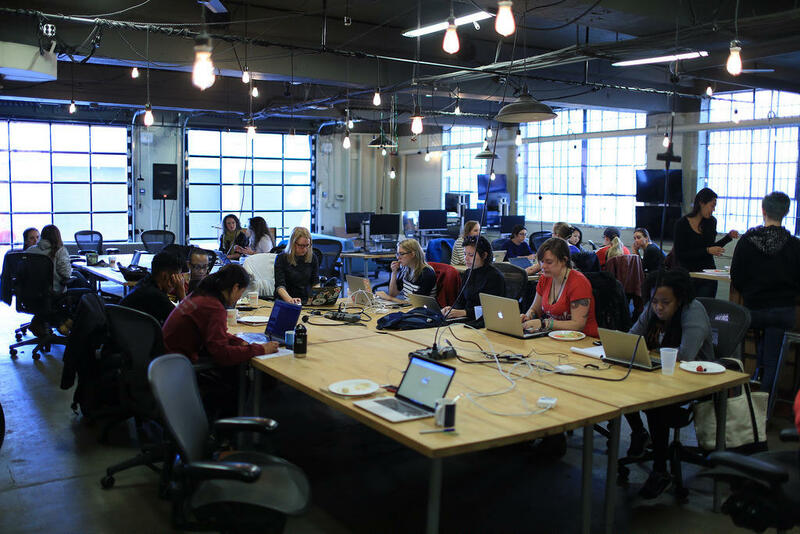 We'll be hosting three introductory sessions on dev skills we apply at Mapbox every day. It's the perfect opportunity to flex your beginner coding skills, and learn what's next! See lineup below for workshop details. Bring your own project, collaborate, ask questions, hangout! We'll host the workshops upstairs, but you're also welcome to hang out downstairs in the open workspace all afternoon. This event welcomes all who identify as female or non-binary, as well as those who support women and minorities in tech. The Mapbox Garage is in the alley behind 14th street. Look for a bright blue building and come on in! Join us in fostering a positive learning environment at MiniConf! All attendees, speakers, sponsors, affiliated groups, and volunteers at Mapbox events are required to agree with the following code of conduct. Organizers will enforce this code throughout the event. We expect cooperation from all participants to help ensure a safe environment for everybody. Mapbox is dedicated to providing a harassment-free experience for everyone, regardless of gender, gender identity and expression, age, sexual orientation, disability, physical appearance, body size, race, ethnicity, religion (or lack thereof), or technology choices. We do not tolerate harassment of conference participants in any form. Sexual language and imagery is not appropriate for any event venue, including talks, workshops, parties, Twitter, and other online media. Event participants or guests violating these rules may be sanctioned or expelled at the discretion of the event organizers. Affiliated groups are also subject to the anti-harassment policy. In particular, affiliated groups should not use sexualized images, activities, clothing/uniforms/costumes, or otherwise create a sexualized environment. Participants asked to stop any harassing behavior are expected to comply immediately. If a participant engages in harassing behavior, the MiniConf organizers may take any action they deem appropriate, including warning the offender or expulsion from the event. MiniConf organizers will be happy to help participants contact local law enforcement, provide escorts, or otherwise assist those experiencing harassment to feel safe for the duration of the conference. We value your attendance. We expect participants to follow these rules at the conference and workshop venue and related social events. If you are being harassed, notice that someone else is being harassed, or see, hear, or experience anything that makes you feel unwelcome, please contact a Mapbox employee immediately. Mapbox employees can be identified as they'll be wearing branded shirts.